If you’re struggling to write your book, here’s an idea: try drawing it instead. That’s how Heather McGowan, academic entrepreneur and futurist, gets started. Visualising your ideas has a double benefit: for you as author, to help you get clear on what it is you’re saying, how your ideas fit together and flow, but also for the reader. And given the astonishing quantity of information that comes at us on a daily basis, demanding our attention – the equivalent of over 280 newspapers a day – this shortcut to communicating complex ideas is a powerful competitive advantage for writers who want to be heard. Heather and I also discuss the future of reading and writing and the skills we need to teach our young people to equip them for the future of work. A fascinating, thought-provoking episode. Alison Jones: Hello and welcome to the Extraordinary Business Book Club. Today, I’m here with Heather McGowan, who’s been described as an academic entrepreneur and visionary, working at the intersection at the future of work and the future of learning. She’s an adviser for large corporations and academic institutions, and her specialism, which is really relevant to listeners of this podcast, is helping people to find clarity and strategy in complex situations. She’s the co-author of “Disrupt Together: How Teams Consistently Innovate,” and she’s in the process right now of writing her second book. Hello, Heather, welcome to the show. Heather McGowan: Hi, thank you for having me. Alison Jones: It’s great to have you along. Tell us at the start about this second book. Where are you at? What challenges are you facing? How’s it going? Heather McGowan: This book is different than the prior book. The prior book, they came to us. I had worked for a college, a university for that matter, and my goal with him was to create a new college within the university that brought together design, engineering and business, so they would have a curriculum that was exclusively focused on innovation. After that, they wanted to hear the story of how we did it, how we brought deaf people together, how we architected the curriculum, how we thought about the experiences students would have, how that would prepare them for the future of work. That was very much a story about something that had already happened. It was a little bit easier because it was storytelling about an event involving a series of people, and it brought together different experts who had been part of that process. This particular book, which is … our working title right right now is called “The Work to Learn.” The idea is that we have gone through our educational processes, learning in order to work, so learning to do something in order to be hired to do that thing. Our philosophy, my co-author Chris Shipley and I, is that in the future, we will be working in order to learn. That is a little bit more complicated because it’s looking into the future rather than into the past, so it’s not about something I’ve done, it’s about something we all need to do. Alison Jones: It’s more of a thought piece as well, isn’t it? You’re sort of saying this is my contribution to the … there’s a space and the thinking around it, which I always find is much harder than just describing something or, as you say, telling a story. Heather McGowan: It certainly is. It certainly is. In terms of it, you know, we’re in a combination of a proposal and full book stage, because we’ve written the book in some form or another in a number of different ways, recasting it, reorganising it. I think the most difficult thing about the process, and this may be true for a lot of people who write books, is how do you frame it? How do you turn it into you run into somebody in an elevator and they ask you between two floors what your book is about, how do you frame it around what are the most salient points? How do you put all the content around that organisation? Alison Jones: How do you? What’s your best … what have you discovered in the process of trying to articulate that? Heather McGowan: For me, all my writing stuff, from my blogs and also from the talks that I give, all really start with visuals, so I don’t usually start writing anything. I start drawing a lot of things. My starting process is: how would I put this on a single page so that people can understand it with very few words using shapes and different types of frameworks? I usually start with a series of frameworks that tell the story to me in my head and then after that I write. Alison Jones: Is that something that comes naturally to you? I know that some people are very visual people and draw ideas. I remember my old boss saying to me that he learned at the age of 50 that if he drew a problem, he could solve it in half the time. But a lot of people don’t feel that they can do that. Do they get hung up on the fact that they can’t draw or they just aren’t visual people? Heather McGowan: Yeah, I would say that everybody can draw in the way that I’m talking about drawing because I don’t think I’m particularly good at drawing either. It’s a matter of, if you can explain it in a framework, you understand the problem, and your boss was, your former boss was probably right in that if he could draw it, then he understood it better. Heather McGowan: Because it takes so many fewer words. You can talk around a problem using a tonne of words, but when it comes to a picture, there’s no extra. You’ve got to really get to the salient point. Alison Jones: There’s something about being able to see, pardon the pun, the whole picture as well, isn’t there? When you are talking, it’s a linear process and you can only ever hold one concept in your mind, but when you draw it, the whole thing is there. Alison Jones: All the relationships between the elements are pinned down in a sort of single point in time. Heather McGowan: Exactly, exactly. Yeah, that’s exactly it. Alison Jones: The visualisation of complex ideas is obviously something that’s really, really core to how you work and what you do. How are you using that in the book? Heather McGowan: I use visual frameworks because it’s much … your visual processing speeds are much more quick and much more efficient. When you look at text, you turn those texts into symbols that you store in your mind visually. When you look at a picture, you can be something like 30,000 times faster than reading all the same information that’s in a picture in a narrative text. This book, most books are between six to nine hours to consume based on the speed at which people read. We predict our book will be between 60 and 90 minutes based on visuals and the nominal amounts of text. Alison Jones: That is really interesting. Tell me the thinking behind that. Who is this for and why does that matter? Heather McGowan: Well, there’s research by a professor at USC, Dr. Hirsch I think is his name. He’s looked at the amount of content that’s coming at us every day. Heather McGowan: If you looked at it in terms of newspapers, which is just an easy unit to understand, in the 1980s, we had the equivalent of about 40 newspapers coming at us every day. In 2008, it became 174 newspapers. In 2014, it became 280 newspapers, so we have this huge amount of content that’s coming at us every day. I think it’s giving us a fair amount of fatigue. You’ll notice now when you open up an article on Medium, and some other people are starting to do it now… based on read speeds, they’re telling you how many minutes it will take you to read that article. That’s how we’re looking at processing content. Microsoft did a study and looked at our attention spans, our sustained attention spans. In 2012, I’m sorry, 2006, it was eight minutes. In 2012, it was … sorry, 2006, it was 12 seconds. In 2008, it was eight seconds. A goldfish has a nine-second attention span, so we’ve dropped below a goldfish in that period of time as the mobile phone came out. That had a lot to do with the increase in the amount of content that we’re consuming and participating in, whether it be through social media or other forms of media coming at us every day. Alison Jones: Is that simple fatigue? I can’t believe it’s a sort of … a cognitive evolutionary step backwards. Heather McGowan: It’s the amount of stuff coming … it’s also behavioural, things that are buzzing around us. How long will you work on something before you check your email, look at your phone, look at your text messages? Heather McGowan: We’re just in this constant cycle of being interrupted, and our attention spans are suffering for it. Visual information, when you look at blogs that people read and they read all the way, they can see that if they have visuals in them, they are much more often read and understood than if they’re just plain text because it breaks it up, it allows you to process things differently. Highly visual I think is the way to go on a number of fronts. Alison Jones: It’s the number of fronts that I’m just thinking about as well because there’s a process that’s useful for you as the author, isn’t there, about the visualisation? It helps you understand and communicate it better. Then there’s a pragmatic level whereby … well, do you know what? The reader isn’t going to give this much attention, so let’s do it as efficiently as possible. Heather McGowan: That just happens to be in my favour right now. Heather McGowan: I’m just lucky in that regard at this moment in time. Alison Jones: Part of me feels a bit, I don’t know, like somehow that’s, I don’t know … it would be good to if we could somehow introduce people to more of a deep dive and to more of a sustained read. I think that’s one thing the book is really good at, especially a print book. It can give you that space for that deep cognitive engagement with an idea that we don’t get in blogs and on Medium and so on. 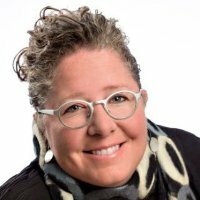 Heather McGowan: Yeah, but I think highly visual books… if you look at some of the books that are out there, like Business Model Generation is a great one, Value Proposition Design, same people… they use a lot of visuals and that tends to help people also start expressing through visual. It’s not that we’re against the print or the text book in the world; it’s just creating a new medium and a new space for people to process information and also express information. A lot of these are written like workbooks that encourage you to draw your ideas. Alison Jones: Yeah, so it’s engaging in that different way of thinking. I know that one of the spaces that you’ve written about quite a lot is automation and the future of work and the fact that so much of what we do is already being automated and so much more that we can’t even think of yet will be automated. Where do you think writing fits on that continuum because I can absolutely see programmes that can take complexity or complex ideas and present them in visual form? Alison Jones: Sort of graphic representations. Heather McGowan: You look at something like Automated Insights, which is built on a Wordsmith platform, which can take any … a string of data, say a sports score or a financial report, and turn it into a narrative that makes sense of that data, seemingly makes sense of that data. A lot of the business news by the Associated Press is now written by Automated Insights, so it’s basically written by artificial intelligence. That fills an interesting gap, I think … on the same side, they’re looking at reading legal documents that way, reading and analysing legal documents. What’s left out of that is the human storytelling element that captures your imagination and makes you want to read more than the two-minute read or the three-minute read that these Automated Insights things are. I think it … just like everything, it elevates the role of somebody who can tell a really good story. Alison Jones: Yeah. I like that idea that this is a supplement, that actually machines can do some things much, much better than we can, so extrapolating as you say narratives or showing patterns in data, and that frees up the writer to do something above that. Alison Jones: Would you think the way we will read in the future, it will change? The way that we engage with the text, how will that change in the future, do you think? Heather McGowan: This sounds a little crazy and science-fiction like, but I could see a time in the not-so-distant future where some information we just download. So you need to read a manual to understand how to do something, well why would you sit down and read that? That’s not necessarily enjoyable. Can you just download that information to your brain so that you will understand how to operate something? As opposed to reading for enjoyment or reading for persuasion, reading to understand something that you really want to understand beyond operate a device or a thing. Alison Jones: Yeah, so you’ve got that purely informational function of reading and I should say that could be automated, which is very similar in the way that jobs get automated and then you get the higher order stuff above that. I think it’s fascinating. I know there was a book recently that won a literary prize that was not entirely authored by AI, but substantially authored by AI. Obviously there’s human input in there, but then there’s sort of an element that goes on beyond that. I do think it’s just the tip of the iceberg. I’d be fascinated to see how it plays out. Heather McGowan: Do you happen to know the name of that book? Alison Jones: I don’t, but I will find out for you. I’ll put it in the show notes as well. I can’t remember the name of it. I know I write a digital digest for the Independent Publishers Group, and I featured that in that a couple of months ago. I think it was in Japan. I’ll find the name for you. Never mention anything unless you can actually remember the name, that’s always a good rule of thumb on a podcast, isn’t it? Alison Jones: I blew it, never mind. In terms of business as opposed to writing, just taking that thread and thinking about how the things that used to matter become less important as they become automated and just do them better than we do. I know you’ve talked about learning. Do you think that is the single most important capability for entrepreneurs as we look forward to 10, 20 years? Heather McGowan: Not just learning, but also unlearning. If you look at a paradigm shift when it happens, you have to unlearn the mental model you had before. If you were driving in a city and the city has changed but you are used to driving a certain a way, a certain point from point A to point B, it doesn’t work anymore if the streets have changed. Similarly, our cognitive operating systems need to upgrade when we have new mental models for things. If you were at a cocktail party and you asked a 22 year old, “Hey, are you going to do some banking tomorrow? What does that mean to you?” and you ask an 80 year old that same question, one of them is thinking about going to a place, interacting with people about probably physical assets or currency, the other one may be thinking about interacting with an app around virtual assets or currency. Those mental models that are just … we’re starting to see some of those shift, like what does driving mean if you were no longer driving if that’s going to be the case? How we navigate that is going to be really interested. Alison Jones: Yeah. It’s the same with calling, isn’t it? I know my mom still uses the landline. She’s the only person apart from people offering to help me with me Microsoft problem that calls the landline. Alison Jones: Yeah, calling means something completely different these days. That’s so true. The learning, the unlearning … it’s interesting as well because they’re some pride associated with that. We spend our careers building up this body of expertise, and it takes quite a lot to be willing to hold it lightly, to be willing to let go of it and move on when it becomes irrelevant. Heather McGowan: Yeah, and on that point, I think that there are three questions we’ve been asking for too long and we need to replace them. We ask people, “What do you want to be when you grow up?” when you’re a kid. We ask people what you’re going to major in when you to college or university. Then you ask people what they do for a living. We need to shift that to, “What is your purpose?” “What is your passion?” “How do you create value?” Because that allows you the flexibility to change from a fixed to a fluid mind-set. Alison Jones: It takes you one step beyond what you’re doing and takes you to why you’re doing it, which is a much more flexible model, isn’t it? Heather McGowan: Right, because when you look at the higher institutions, I’m in the US, and you apply at many universities into a major. Based on the high school, you have very little experience in terms of what the world is and what you could possibly do, and if they ask you to pick an identify and then they calcify you into that identity and by the time you’re out, your debt is going to last longer in many cases than your profession. You’re not equipped to unlearn, relearn, shed that identity and acquire a new one. I think that’s a big part of what we’re talking about in the book. Alison Jones: But of course the academic system is not well set up for that kind of flexibility, is it? It itself is one of the most calcified bodies that there is in that the tenure route and so on, it’s slow to change. Heather McGowan: Right. One of the universities I’m working at right now, we’re developing the core curriculum that all students take regardless of what their major is called “Agile Mind-set.” The idea is basically you are going to have to shed your professional identity, most likely, and acquire another one, so what are the skills around learning agility and value creation that you need to have that will weather you through your first career to your second to your third to your fourth? Alison Jones: That’s interesting. There’s so much resilience built into that, isn’t there? I think that’s the thing that’s going to cancel the fear. I remember … is it Victor Hugo, that wonderful quote about, “Be like the bird who when the bough below her breaks yet sings knowing she has wings.” It’s that sense of not being dependent on any one role or vision of yourself because you can perpetually reinvent yourself. Heather McGowan: Yeah, we’re still teaching people to swim at time when we really need to teach them to fly. Alison Jones: What does that mean as a writer, because one thing a book does tend to have is a shelf life? A longer shelf life than say a blog post. How do you write knowing all that, knowing that way you’re writing may be true now, may advance the conversation, but may actually become irrelevant? I know that some of my authors worry about that. Heather McGowan: What we’re writing probably should be irrelevant! So we talk about creating new mental maps, but we’re clear that this is not the book that gives you the new mental maps. This is the book that teaches you crumble up and throw away or burn and create new ones. The content in our book should it go on in time will have to certainly be updated but probably just need to be replaced. Alison Jones: Sorry, it does need to be replaced or it doesn’t? Heather McGowan: No, it should probably need to be replaced. There may be a scenario in which some of the … we’re structuring around drivers’ routines and shifts that you will have to make, that there will be new drivers and new shifts. In all likelihood, it just is a book that probably should expire. Alison Jones: Mm-hmm (affirmative). That’s okay. Again, that’s giving yourself permission to write what needs to be written now, to move the thing on the next step, but to know there’s another book in only two years’ time which is going to be the next thing to say at that point. Alison Jones: Where does a book fit into a business these days, do you think, Heather? Heather McGowan: It depends on who you mean it for. I think that for us, and like many business individuals, it’s a platform for us to talk about the kinds of work we do, so Boards is part of a personal brand. But for an organisation, if we were a part of an organisation – Boards – it might be part of their personal brand as well. For organisations, I don’t think there’s ever been a greater velocity of change and a greater time for people to need to understand that shift in context, so books are suddenly becoming really important. If you work within an organisation, you only know how that organisation operates in the context of that industry in a world in which the context is changing, the industry is changing, the companies are changing, it has never been a more important time for you to be reading broadly and often. A lot of these books I think are important learning tools for the organisation, which is capacity development for them. Alison Jones: Yeah, the book is so good isn’t it at pulling ideas from a number of different areas and combining them in new ways and triggering new thoughts in each reader as well. It’s part of that process of innovation. I do feel that writing as well as reading is such an important business discipline. It always amazes me between the world seems to be split between people who feel they haven’t got time to read and people who think they haven’t got time not to. Heather McGowan: I don’t think there’s no more time not to because reading being the input of information, however you get it, whether you listen to podcasts or you watch TED Talks or whatever your medium might be or if you actually sit down and read. There’s never been a more important time to get new information, to keep your cognitive operating system continually updated. Alison Jones: That’s a fabulous way of putting it, thank you. Now if you were to give one tip to somebody who’s listening and who’s in the throes of writing their first book, what have you learned? What could you say to them that would help them just get through this bit and finish their book? Heather McGowan: You’ve got to answer the question why are you writing it and who are you writing it for and what’s your key message and why does it matter to them. If you don’t have answers to those three questions, you’re just sort of writing a book for yourself. That’s fine as long as your expectations are calibrated around the fact that you’re just writing a book for your own self-expression and somebody may or may not ever read. If you can clearly identify why you’re writing it in terms of your personal passion, who it’s for and how it’s going to change them, then you have a lot clearer framing and it should help you keep focused. Alison Jones: Yes, superb advice. Of course, when you’re running a business, aligning that person that you’re writing for with the person that you’re trying to reach with your business message is really important as well. It sounds really obvious, but you’d be amazed. Excellent advice, thank you. Now I always ask people on this show if they could recommend a guest, which I’ve found fantastic at broadening my own horizons … I would never have met you, for example, if Barbara hadn’t recommended you. Who do you think has something interesting to say about the business of business books or sort of writing in general that you think would be good to have on the show? Heather McGowan: I’ve got several. Alison Jones: Oh good, all right. Heather McGowan: I’m not always sure I’m pronouncing their names correctly, but Mark Bonchek, who – I know that I’m saying his name correctly – he writes for Harvard Business Review, and he talks about shifts (his company is called Shift Co), the different shifts that businesses need to make, so he’s really into understanding macroshifts that are taking place that are going to bubble up and do sort of a major shift that you’re going to have to make. He was one of the … I think he was the first person to get his PhD out of Harvard in social media, and his thesis was on how it was going to change politics, which will be playing out this year in the US. Alison Jones: Wow, yeah, that was prescient. Heather McGowan: Yeah. He’s really good. Greg Sattell. He writes for Harvard Business Review and he writes for Forbes. He writes for his own blogs and similar to Mark he looks at a lot of trends taking place in business or technology or social change that are going to affect how businesses operate. Then Thomas, also I don’t know if I’m saying his last name correctly, Oppong. He writes a lot about the future of work and how the millennials will have to rethink kind of what their roles are going to be and how they’re going to create value and how they think about work in general and jobs in general. He’s got some really good advice. He writes a blog on Medium that has a lot of people on it. Then Dave Pell. He writes a lot on startups. He’s big on the election right now, but just because politics and business are so intertwined. Heather McGowan: He’s got some really good … and salient, he writes things that take three minutes to read but they’re really impactful. Alison Jones: I should say that we’re recording this in December 2016. I know you won’t be listening to it for a little while yet, so we’re all still very, very much into the [US presidential] election and the ramifications of that and we’re not quite knowing how it’s going to pan out. This is all very much on our minds at the moment. Brilliant. Those are quite a lot of recommendations, thank you. I’ll get on to each of those and follow them up. Such a fascinating area, I really, really want to get some more insights into this, so thank you for those recommendations. Now if people want to find out more about you, Heather, and about your writing, about your books and about the work you do, where can they go? Alison Jones: “Work to Learn.” Just … I meant to ask you this when you were talking about “Work to Learn,” how long is the book in terms of traditional extent? Number of pages, number of words? Because I’m just interested in how the visuals fits in with that. Heather McGowan: Yeah, we think it’s going to be about 200 pages, that’s going to be our guess, so it’s sort of … maybe 250, we’re not sure. Some of it depends on how it’s laid out and which size we end up going with, but it’ll be sort of a quick-to-read, heavily visual book. Alison Jones: Brilliant. I think that’s a really good length for a business book. Beyond that, I always feel people are repeating themselves unnecessarily. Fantastic. What a fascinating conversation. It raises so many more questions. We could talk about it all day. I really appreciate your time, Heather. It was fantastic to talk to you. Thank you. Heather McGowan: Thank you very much. books, communication, drawing, future, information, reading, visualising, writing. Bookmark.